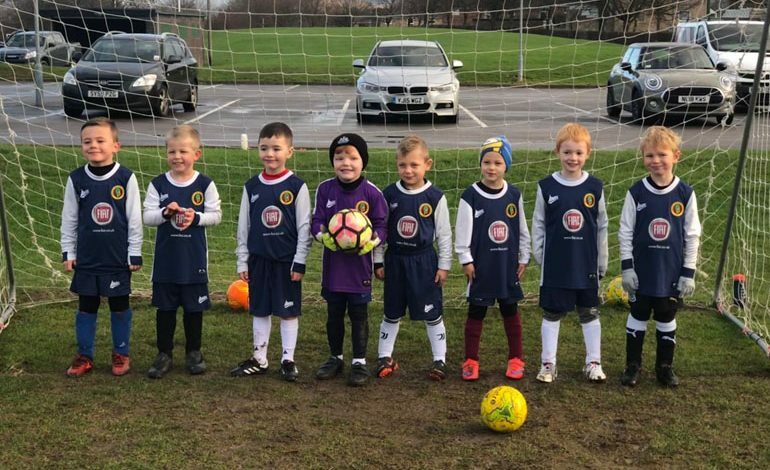 The wet weather didn’t stop the Aycliffe Juniors footballing action over the weekend when there were many games to enjoy. The Under 6’s took part in a joint training session with Crook. These players have just started playing over the last year and really enjoyed the opportunity to face local opponents. The Under 7’s White played Durham County and came away with a 3-0 win. Tyler scored twice with Jack R also on target and Sammy was named as man of the match. The Under 7’s Juniors enjoyed a friendly away at Cleveland Juniors. An exciting game ended 8-7 to Aycliffe with goals from Dan (3), Jonah, Dom, Jack, Kai and Marley. There was some great football played and Daniel was chosen as the man of the match. The Under 8’s braved some tough conditions to play Darlington Spraire lads and a tight game ended 0-0. The Under 9’s played a very strong Leven team and couldn’t get anything from the game. Men of the match were Callum and Oscar. The Under 10’s Claret faced high flying Darlington Youth. A determined effort matched the hosts initially but they couldn’t get anything from the game. The man of the match was Joshua J. The Under 11’s White played a friendly game against Leven. A good 4-1 win was secured with goals from Niall, Jack and Aidan who added two. The Under 12’s travelled to play Greatham. They put in a good effort but lost out by one goal to nil. Cody was selected as the man of the match. The Under 13’s Russell Foster League team played Shotton Colts Reds and won the game 7-1. The Under 13’s TJFA League team hosted Leven Athletic at Woodham and won 2-1. They went ahead with a goal from Zack and after Leven drew level Charlie Bunton scored the winner. The Under 14’s won an exciting derby against local rivals Sedgefield. A wonder strike from Dylan opened the scoring but Sedgefield then levelled the game with only ten minutes left. The winner then came in the last minute from Jake Watson. Jack Lambert was the man of the match. The Under 17’s played unbeaten Redcar, their task was made more difficult after a sending off reduced them to ten men. The score stayed at 0-0 with only fifteen minutes left. Redcar scored twice before Noah Ellis’ free kick halved their lead. Aycliffe pushed for an equaliser but it was Redcar who completed the scoring and won 3-1.